Five years ago when Rob Rae joined Datto Inc., opportunities to grow the business through the channel were slim, and as one of the cybersecurity and data backup firm’s first Canadian employees, he wasn’t sure what the future had in store. The main lobby at Datto’s new Canadian headquarters in Markham. Photo from Datto. 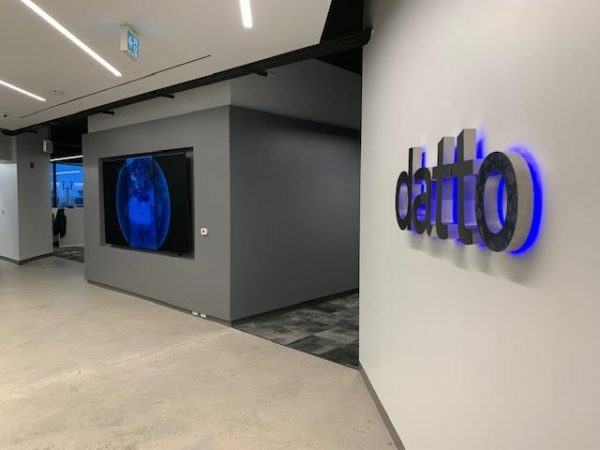 So much so that Datto now has more than 1,100 partners in Canada, and a team of approximately 20 people in the new Markham office that’s helping solidify the company’s dominance in the Canadian market, said Rae. Datto expects to onboard partners at a clip of 25-30 per month, representing an approximately 30 per cent year-over-year growth. And since Datto’s focus on the SMB market remains steadfast, that means there are a lot of customers they haven’t reached, Rae pointed out. In Canada, more than 90 per cent of businesses in Canada are small-to-medium-sized businesses. Datto CEO Tim Weller said Canada is integral to the company’s success. “We’re in 100 countries, six or eight of which are a core part of our business and [Canada] is definitely the first and the numbers show that,” he told everyone during the ribbon cutting ceremony. Datto Rob Rae, vice-president of business development, and CEO Tim Weller, talk about the importance of their new Canadian headquarters. Photo from Datto. Datto’s Canadian Advisory Board, comprised of several business partners, is also helping shape the Canadian channel landscape by spurring important conversations among its members, according to James Smith, president of Lanetco, a managed service provider in the Greater Toronto Area. Lanetco, which also has an office in Vancouver, has been a Datto partner for five years and for the most part specializes in Datto’s business continuity and data recovery portfolio. Smith said he was actually participating in a board meeting prior to the ribbon cutting ceremony, and that he’s also a member of Datto’s Global Advisory Board. 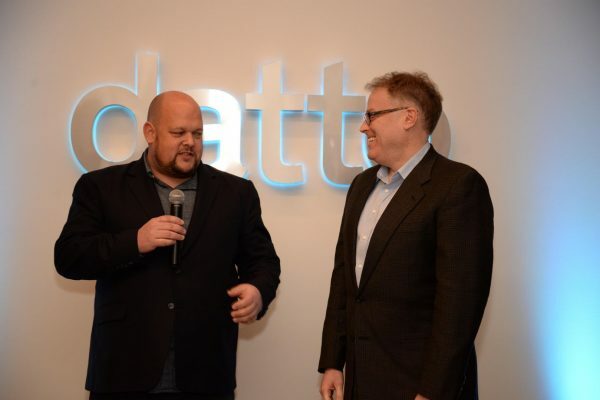 Smith said he’s been impressed with Datto’s service delivery model and breadth of solutions, which has grown over the years thanks to some key acquisitions. Datto’s portfolio of products, which now include networking and business management, have left strong impressions on Lanetco and its customers, he added.